If the links in your blog show the wrong domain, redirect to another site or if they are missing images or styling, this is typically due to an improperly configured URL for your blog's domain name in your database. To resolve the issue, you will need to update your domain in WordPress; this update will also be necessary to make your blog display and function properly with your temporary web address or secure web address. Check the wp-config.php file in the appropriate directory to get the WordPress database name. In the Files section, click the File Manager icon. 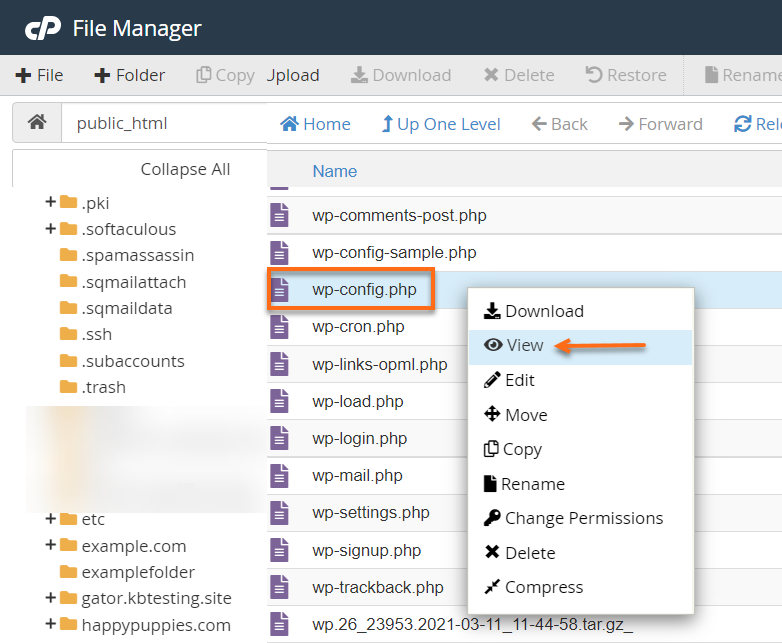 Select the wp-config.php file in the base directory for your blog. Right-click on the file and select View. Exit the File Manager and return to cPanel home. In the Databases section of cPanel, click on the phpMyAdmin icon. In the left menu, click on the database name. In the left menu, click on the wp_options table. In the option_name column, look for the siteurl and home variables. Change those variables to the correct address for your blog. Click Edit on the far left of the option name. On the next page, place the full URL for your site into the large text box in the option_value field. If you are using your temporary URL or shared SSL address to preview your blog on the HostGator servers, be sure to change the siteurl and home database values back to your normal domain if you want your blog to work with your regular domain name once your name servers (or DNS) have been switched over to HostGator. This method cannot be used if you cannot access the WP-Admin section of your WordPress installation. WordPress allows users to update their domain name through the administrative access panel; however, this should be done with caution. This method is best for users who wish to update the domain prior to a directory change. In the left menu of the dashboard, click Settings. Under General Settings, in the WordPress address (URL) field, enter the new domain. In Site address (URL) field, enter the new domain again. If you've lost or forgotten your WP-Admin username or password, navigate to the login page (http://yourdomain.com/wp-admin/ ) and click the Lost your passwordlink. You will be prompted to enter your username or email address in order to receive an email with your username and a link to create a new password at the email address you entered when you created your blog. In cPanel, go to File Manager or connect via FTP. Navigate to your WordPress directory.